Inkstampshare: Inspire.Create.Challenges #004 Colour Callenge! This week for the Inspire Creates Challenge we have a Colour Challenge. Such a pretty colour combination and perfect for a wintery feel. 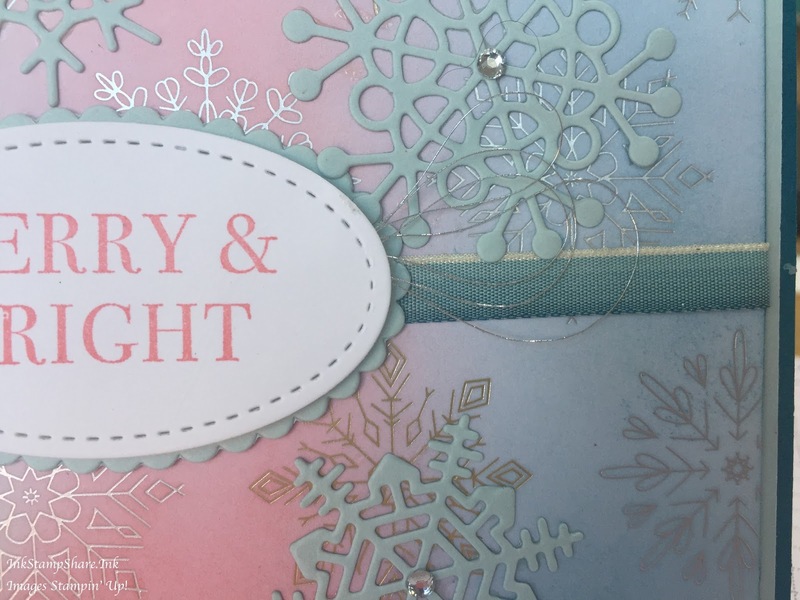 I love Christmas cards in blues and pinks. They make a nice change from the traditional reds and greens of Christmas. I have used the beautiful Year of Cheer Designer Series Paper from the Autumn/Winter Stampin' Up! Catalogue. It's foiled in silver and gold, this piece with snowflakes. I sponged Soft Sky, Flirty Flamingo and Island Indigo softly across the paper. 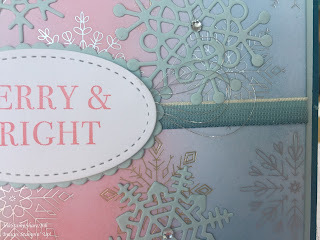 The foiling creates an emboss resist effect allowing the beautiful snowflakes to shine through. The card base is in Island Indigo with a layer of Soft Sky under the Speciality DSP. 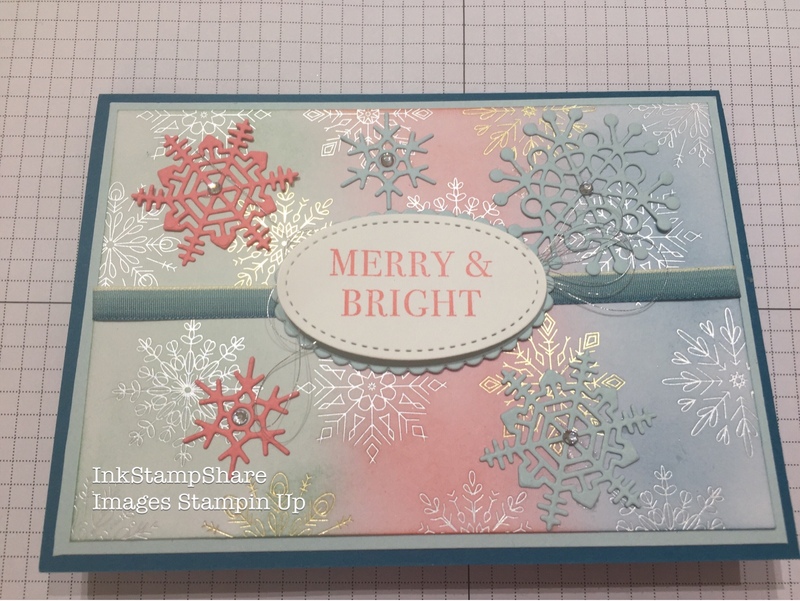 I have stamped the sentiment Merry and Bright from the Hearts Come Home stamp set onto a scrap of Whisper White and cut out using an oval from the Stitched Shape dies. I layered it using Dimensionals onto a scalloped oval in Soft Sky cut with the Layering Oval dies. I have looped some of the Silver Metalic Thread between the layers using the dimensionals to secure it. I really love the ombre ribbons. 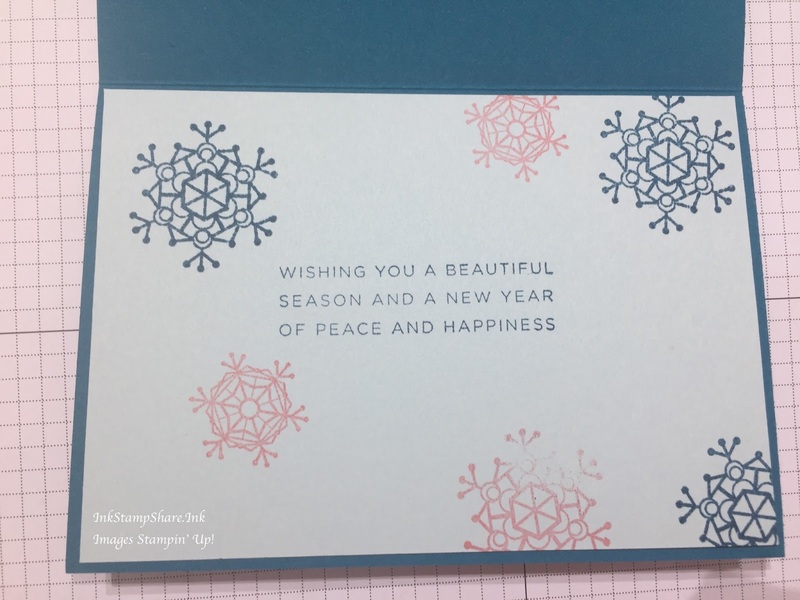 They are so beautiful and in Island Indigo just had to use it on this card. The Snowflakes are cut out from the Seasonal Layers dies. I love these dies, they have something for every season included. I used Soft Sky and Flirty Flamingo card scraps to cut them out. I have added a few of the rhinestones for a little sparkle. The inside sentiment is taken from the Hearts Come Home stamp set and the snowflakes from the Colourful Season stamps. I really hope you like my card. Hop over to the Inspire.Create.Challenges HERE to see what the rest of the Design Team have come up with for the challenge and to see all the other entries too! Play along with the challenge and post your link. We Would LOVE to see what you come up with. It is open to everyone and each fortnightly challenge a winner from the entries is chosen.